Pleasant Prairie, WI. — One of the largest and most prestigious action sports events on the planet returned to Pleasant Prairie with the opening day of the Rockstar WWA Wakeboard World Championships presented by Supra. Over the course of the next four days, more than 200 of the world’s best professional and amateur wakeboarders and wakeskaters, ranging in age from seven to 50+, will compete in the annual event for a shot at a coveted world title. Opening Worlds in grand fashion today were 14 divisions featuring male and female riders from across the planet. Paramount day one performances came from the Junior Men, which was the day’s most competitive division with 16 riders across three heats. Australian rider Lewis Watt showed off a full arsenal of tricks including wake-to-wake rotating aerials, technical grabs and overall stylish riding to claim first place in his heat posting a divisions high score of 85.00 to advance to tomorrow’s finals. Fellow countrymen Shannon Speering and Joel Bartley also won their heats giving the Aussies a clean sweep in the Junior Pro semifinals. Both riders put on impressive runs that featured smooth toe-side and heel-side riding while boosting huge airs off one of the world’s best wake’s from the Supra SA550. Wakeskaters also took advantage of the calm Lake Andrea waters today for semifinal heats. Turning the ultra smooth Supra SC550 wake into his personal launch ramp, Cristobal Mendez registered the discipline’s run of the day. Meshing wake-to-wake airs with highly-technical flip tricks, Mendez registered a day-high score of 70.00 to place him as the favorite in tomorrow’s World Championship finals heat. Tomorrow’s action is free and open to the public. Saturday and Sunday’s competitions are ticketed events. Online adult tickets are available for $7 (46% off the gate price) and include an exclusive Overton’s discount code for online buyers only. Gate prices are: $13 (adult); $5 (ages 6-12); free (ages 5 and under). 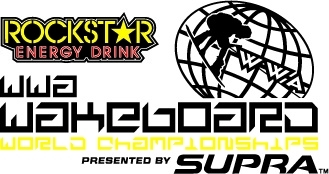 For more information on the Rockstar WWA Wakeboard World Championships presented by Supra, visit KingofWake.com. The Rockstar WWA Wakeboard World Championships presented by Supra is organized by World Sports & Marketing of Orlando, Fla., and has the support of the following sponsors: Supra Boats, Rockstar Energy Drink, WWA, Overton’s, Indmar, Polaroid Action, Ronix, Fox, Zeal Optics, CWB, Hyperlite, Liquid Force, Byerly, Peavey, Sayiwon’t, Epiphone and YOUR MOM magazine. At Supra Boats success lasts long enough for a high five or a pat on the back and then it’s back to the digital drawing board. The 2014 Supra Boats line embodies this drive for continuous improvement. We are not concerned with being better than the next wake boat manufacturer. Our goal is to go beyond better by creating wake boats that elevate your expectations of what you and your boat can do on the water. From interior and exterior design to ride, wakes and handling performance to the team that puts it all together, Supra boats are going above and beyond in 2014. With the success of the SA350-550 still relatively new, Supra Boats designers started working on something that would smoke the competition. The new SC350-550 was developed as a refined traditional bow boat with the performance of an SA and interior accommodation like nothing the industry has seen. This amazing new Supra’s design has lead to a number of advancements where passion meets precision on the Pro Rider’s Choice SA350-550, the luxury riding Launch 242 and the world famous Worlds Edition package. Visit your local Supra Boats dealer and elevate your expectations to beyond better wake boating with the 2014 Supra boats. (http://supraboats.com) Skier’s Choice encourages all boating participants to learn and follow safe boating practices. what it takes to work through it from someone who has done it before. You're now prepared for battle against the world! It forms a sequence of occasions and enlarges as you carry on the perform. The questing is mounted on the main story-line. It is really a multiplayer video game, played in the fairy land of the Wow-cosmos.